ZINOL MULTI-PURPOSE GREASE is formulater with quality base oils, lithium hydroxide, 12 hydroxy stearic acid which contains a wide range of moderate service application. It is recommended for automotive and industrial applications operating in moderate temperatures and load. In general it is intended to lubricate chassis components, wheel bearings, clutch bearings, universal joints and ball joints. ZINOL MP GREASE, as a multi purpose grease, is suitable for applications found in industrial and automotive applications, such as electric motor bearings, fan bearings, pump bearings, wheel bearings, steel joints and other plain anti-friction applications. It is recommended for use where operating temperature is up to 130°C. 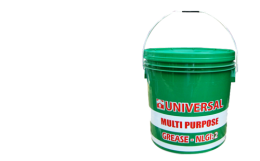 Multi-purpose grease for a wide range of applications. Sticks to bearing surfaces to give long lasting protection. High resistance to water wash-out.